Hyderabad’s real estate market has grown slowly but steadily in 2015 backed by the improving commercial sector, political stability and several policy announcements by the state government. A similar trend was witnessed in Oct-Dec 2015, when the average capital values in the city grew by a per cent in comparison to the last quarter. 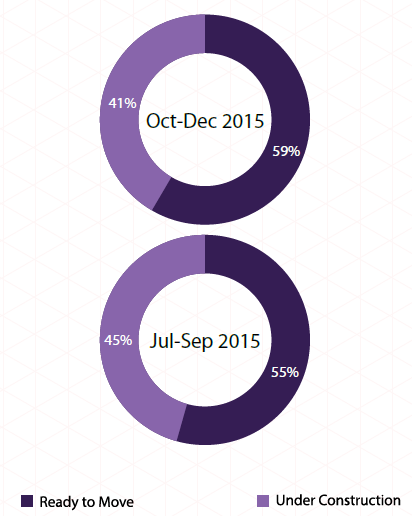 Residential projects across the city witnessed an increase in site visits in the last quarter of 2015. However, deal closures and transactions did not improve as much as the industry would have preferred. Like the rest of the year, absorption rates were highest in the western quadrant of the city. East Hyderabad also showed some signs of improvement. The North and South zones, however, continued to remain sluggish majorly owing to poor connectivity and slow pace of infra development. Besides the IT/ITeS sector, the upcoming metro connectivity acted as one of the major growth stimulators. The Stage-2 of Corridor-I from Miyapur to SR Nagar and the Stage-1 of Corridor-III from Nagole to Secunderabad are expected to be functional in the first quarter of 2016. A few luxury and mid-range projects have been launched in and around the metro corridor. Hyderabad witnessed some major deal closures and leasing activities in the commercial segment in Oct-Dec 2015. This helped the capital and rental values of office spaces in the city. Areas such as Hi-tech City, Madhapur, Miyapur and Gachibowli, which boast of high supply of ready-to-move Grade A offices, witnessed maximum enquiries, leasing and transaction activities. Office rents in these areas increased by 10 per cent in the last six months. Water crisis in the city became severe in the last quarter with the ground water level recording the lowest reading in the last 30 years. Areas with water supply from Manjeera river and Singur lake such as Deepthisri Nagar, Kukatpally, JPN Nagar, Mayuri Nagar, Mythri Nagar, Madinaguda and Patancheru suffered the most on this account. The last three months witnessed a decline in supply of raw materials which led to an increase in the cost of cement, sand and bricks. This development impacted the small developers severely, who were forced to halt their projects. With nearly 60 per cent of the localities registering a rise in the average capital values during Oct-Dec 2015 in comparison to the quarter ending September 2015, Hyderabad capital market seems to be improving steadily. A slight improvement in the sales volume and subsequent reduction in the ready-to-move inventory allowed developers to increase prices marginally. The launch of a few premium projects pushed up the average capital values in Dilsukh Nagar. The locality witnessed a rise in capital values to the tune of seven per cent – the highest in the city in the last quarter. Localities such as Gachibowli, Kondapur and Manikonda in West Hyderabad scored well on the liveability index due to their proximity to work places. While Gachibowli and Kondapur recorded a quarterly appreciation of five per cent each, capital rates in Manikonda grew by three per cent in Oct-Dec 2015 as against the previous quarter. The presence of villa projects attracted buyers to Bachupally. Capital values in the locality clocked a rise of four per cent in the last three months. Localities in Central Hyderabad continued to witness a drop in property prices. While average property prices fell by a per cent in Banjara Hills, Jubilee Hills and Ameerpet recorded a dip of three and five per cent, respectively. While other areas, specifically those situated in West Hyderabad, offer premium properties with world-class amenities, localities in the Central Zone have presence of just spacious dwellings. As buyers are driven by value for money, not many opted for the residential inventory in this region of the city. The rental market of Hyderabad remained strong despite the general slowdown, documenting an average yearly growth of two per cent. Those with properties near office hubs managed to increase the rents slightly in the last one year (Oct-Dec 2015 vs. Oct-Dec 2014). Currently, majority of the rental demand in Hyderabad is concentrated in locations close to either IT/ITeS companies in the West or educational institutions in Central Hyderabad. However, once the metro becomes functional next year, this trend is expected to change and rental demand would scatter all around the city. Localities such as Kukatpally, Gachibowli and Madinaguda witnessed the highest rise in rental values to the tune of 11-18 per cent in the last one year. The presence of rental inventory across all budget segments along with proximity to office hubs make these popular among the tenant community. Ameerpet and Begumpet, on the other hand, are preferred by students and families. The localities recorded a respective rise of 10 and eight per cent in the said period. While the capital market failed to pick up in Jubilee Hills and Banjara Hills, two of the premium localities in Hyderabad; the rental demand continued to remain strong here with values appreciating by six-seven per cent in a year. The rental values in localities such as Madhapur, Kondapur, Chandanagar, Manikonda and Nizampet saw a slight correction in Oct-Dec 2015 in comparison to the same quarter previous year. These localities had a high vacancy level in comparison to other nearby areas, inducing the said correction. With end users finally entering the buying circle, developers in the city are completing their halted projects in a haste. Hyderabad is thus currently witnessing a high supply of ready-to-move-in properties. Interestingly, majority of the transactions that have taken place in the city in the last three months have been in projects nearing possession. 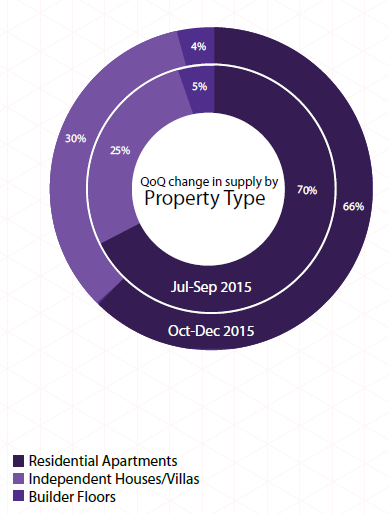 Supply remained almost unchanged across all property types in Oct-Dec 2015 in comparison to Jul-Sep 2015. Residential apartments continued to be the most demanded and supplied property type listed in Hyderabad. Demand for independent houses/villas is present in select pockets such as Bachupally, Kompally, Uppal and Secunderabad. These localities not only boast of a well-developed infrastructure but also offer affordable inventory. The migrant population in Hyderabad favours society apartments and the native populace go for individual houses, making builder floor units the least preferred property type in the city. Hence, even the supply of such units continued being low and stood at a mere four per cent in the quarter ending December 2015. The supply of residential apartments continued to remain concentrated in the Rs 40-60 lakh category, while independent house/villas and builder floors were majorly available in the Rs 25-40 lakh budget category. The mid-income housing segment, constituting residential inventory in the bracket of Rs 25-40 lakh, generates majority of the demand and thus, sees the maximum number of transactions. This helps in exhaustion of the stock in the category. Though such housing is concentrated in far-off places, with improving social and physical infrastructure, these have become the first choice for buyers looking for affordable housing. The new launches in Oct-Dec 2015 were majorly concentrated in this budget range. Luxury housing and ultra-luxury housing segment, on the other hand, continued to suffer due to lack of buyer interest. The average age of inventory in the premium segment in Hyderabad is nine quarters. Even though the government is focussing on promoting affordable housing, developers in Hyderabad seem to stay away from it. With rising construction cost and relatively low property prices in comparison to other metro cities, developers in Hyderabad do not find the segment lucrative. Supply of properties priced below Rs 25 lakh is thus the lowest in the city, capturing a mere 13 per cent of the total residential supply. 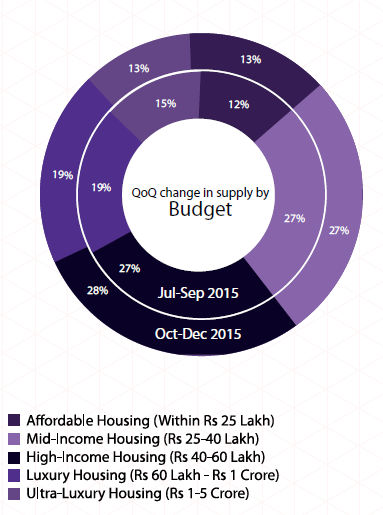 Among all budget categories, luxury housing segment witnessed the highest rise to the tune of 10 per cent in the supply of ready-to-move properties during Oct-Dec 2015 in comparison to the previous quarter. 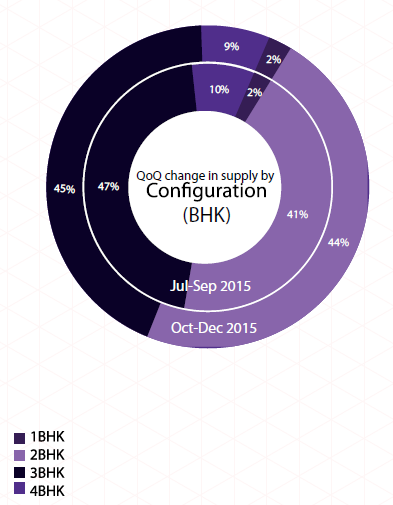 Hyderabad is witnessing a mismatch when it comes to supply of different BHK configurations. While demand is highest for 2BHK units, supply remains high for 3BHK units. Developers in the city find construction of larger spaces more profitable, while buyers find them unaffordable. In Oct-Dec 2015, nearly half of the residential apartments offered were 3BHK units. Most of these 3BHK units were available in the budget range of Rs 40 lakh to Rs 1 crore. On the other hand, 2BHK units can easily be found in the price bracket of Rs 25-40 lakh. Nearly 65 per cent of the available 2BHK units in Hyderabad were ready to move. On the other hand, 3BHK units had an equal share of ready-to-move and under-construction properties. Larger homes (3BHK and 4BHK) are mostly being preferred in peripheral areas such as Bachupally, Kompally, Narsingi, Bowenpally, Sainikpuri, Uppal and Habsiguda. Availability of such properties in the mid-income range propel customer enquiries and healthy consumption rates too. The over stretched stillness in the Hyderabad property market has created an aberrant situation where buyers are not willing to put their money in under-construction or newly-launched projects, fearing delays in possession. Hence, the supply of ready-to-move properties remained dominant in Hyderabad all throughout 2015. Also, unlike other metro cities, Hyderabad has not witnessed high levels of Private Equity (PE) and Foreign Direct Investments (FDI). Hence, developers are desperately disposing off their ready-to-move properties in order to enhance cash flow. 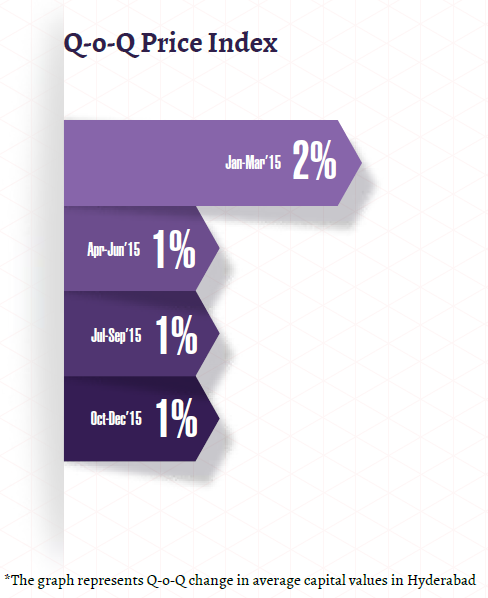 Supply of ready-to-move-in properties witnessed a four per cent rise in Oct-Dec 2015. It captured more than half of the total market share in the city. Out of the total inventory of builder floor units, majority were ready to occupy. On the other hand, in the case of independent houses/villas, maximum units were under construction. Majority of the ready-to-move properties in Hyderabad were available in the price range of Rs 25-40 lakh during Oct-Dec 2015. Supply of under-construction properties was concentrated in the Rs 40-60 lakh category. Supply of ready to move 3BHK units grew by five per cent in Oct-Dec 2015 in the city while 4BHK ready to occupy units saw an eight per cent increase. On the other hand, supply of ready to move 1BHK and 2BHK units declined in the last quarter. Supply of ready to move properties in the Ultra-Luxury housing segment (Rs 1-5 crore) grew by six per cent in the quarter ending with December.